The Occupational Safety and Health Act, passed in 1970, made it mandatory that safety showers and eyewash units be located wherever there is a potential danger from exposure to hazardous materials. Emergency showers have to deliver not only adequate amounts of water, but disperse it so that the entire body can be purged simultaneously. Eyewash units are also required to deliver an adequate amount of water for rinsing, but the water flow has to be softened so the force does not drive the contaminants into the optic system. Speakman introduced the first emergency shower for industrial safety in 1939, and Speakman products have led the safety industry with innovative designs and proven safety systems for over 50 years. 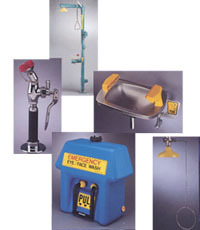 Speakman Emergency Equipment meets or exceeds Industry Standards, including ANSI Z358.1-1990. In addition, the equipment is currently being upgraded to meet ISO Standards. This change incorporates a new green paint color on our SAFE-T-ZONE ® Combination Stations. The green significantly enhances product appearance and is more corrosion resistant.